May 23 was the 1,200th trading day since S&P downgraded the United States from its top AAA credit rating on Friday, August 5, 2011. A year ago (May 21, 2015), the 10-year Treasury yielded 2.19%. A year later, on May 20, 2016, the 10-year Treasury closed at a yield of 1.84%. A year ago, the national debt was $18.152 trillion. A year later, the national debt was $19.212 trillion. But none of these items is headline news for the financial media. Instead, all eyes are on the stock market. And we get “A Year Later, Record Eludes Dow” (The Wall Street Journal, May 19, 2016), and variations of the same for the S&P 500, reinforcing the message of just how long a new record has eluded these indices. So let’s start with the facts about the two major U.S. stock market benchmarks. On May 21, 2015, the S&P 500 had a record close of 2,130.82. On May 20, 2016, the S&P 500 closed at 2,052.32—3.7% below the record close of a year ago. 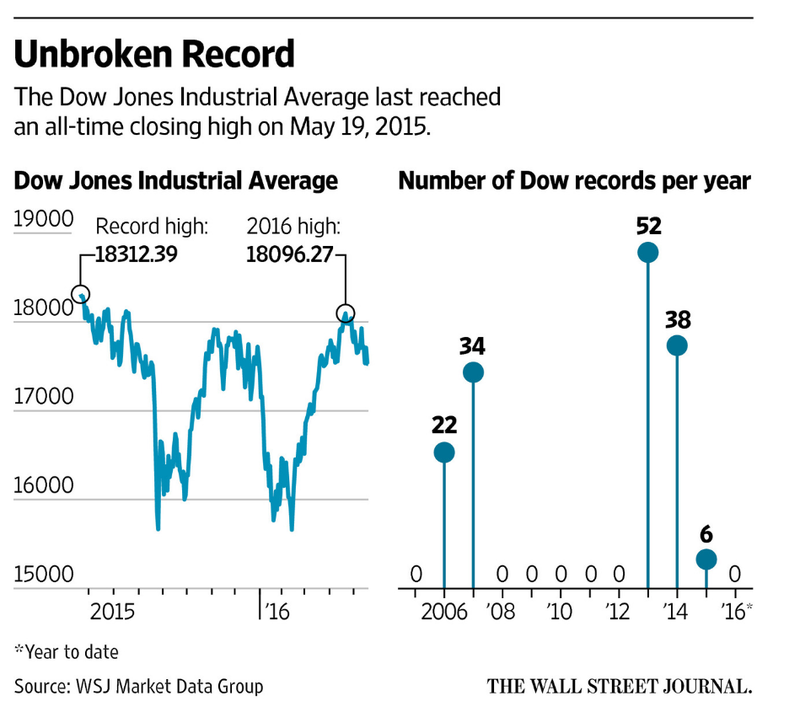 On May 19, 2015, the Dow Jones Industrial Average had a record close of 18,312.39. On May 20, 2016, the DJIA closed at 17,500.94—4.4% below the record close of a year ago. As The Wall Street Journal story reminds us, it’s now been a while since the Dow index reached a new record high. And this dry spell comes on the heels of six new record highs for the index in 2015, 38 in 2014 and 52 in 2013. In fact, it’s been the longest stretch without a record close in more than three years (see chart below). We need to go back to 2012 to find the last calendar year that the Dow and S&P 500 did not hit a record close. And in that case, the indices were recovering from the financial crisis and five straight years without a record high. Then, of course, we need to get to the why. Why not double digit new record highs in 2016, as was the case in 2013 and 2014? Valuations (high). The S&P 500 has a trailing price/earnings ratio of 18.5, higher than the 10-year average of 15.8 (FactSet). (Never mind the context of in the current interest rate environment). Corporate earnings (poor). First quarter earnings are down 7% from a year ago, the fourth quarter in a row of declines (FactSet). Stock buyback authorizations (low). Companies have announced authorizations for $277 billion in stock buybacks this year, a 38% decline from the $448 billion authorized at this time last year. On the other hand, the absolute level of authorized buybacks at $732 billion through the end of April is high (the third-highest annual total since 1985) (Birinyi Associates). Mutual fund redemptions (high). Through the week ended May 11, mutual fund investors have withdrawn nearly $68 billion this year from U.S. equity mutual funds and exchange-traded funds (Thomson Reuters Lipper). So what do we make of all this? Nothing. Over time, stock prices are inextricably linked to the earnings and dividends they generate for their owners, though not at all precisely. They fluctuate. The stock market historically has advanced over time, though not in a straight line. As the table below illustrates, the stock market is up on only 53% of individual days. 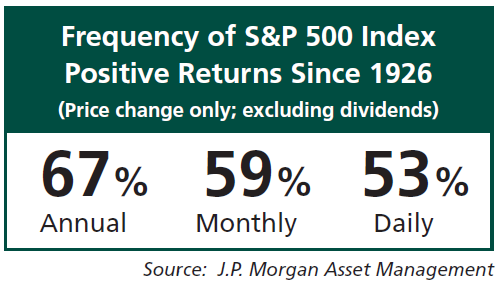 But if one lengthens one’s perspective to look at months and years, the frequency of positive returns rises to 59% and 67%, respectively. Conclusion: The volatile and asymmetric returns experienced over days and weeks are smoother over the course of months and years. Do you think that the earnings and dividends of the 500 leading companies of the United States will be higher five or 10 years from now than they are today? 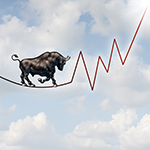 If so, you can also reasonably expect more record highs for stock indices along the way.